“Vox Lux is a film very much of its time, and yet fiercely in opposition to its time — utterly modern yet demonstrating utter repulsion at modernity. 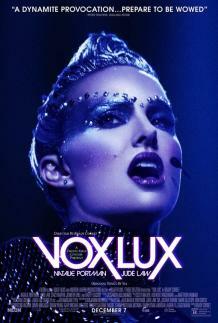 Through the story of a teenage girl who is wounded in a school shooting and grows up to be a Gaga-like pop star, Vox Lux aspires to tell the moral history of the 21st century. And it does. Yes, this is the movie our century deserves, with its mood that is never quite despairing, because you can’t have despair if you’ve never had hope. Rather, the feeling of Vox Lux is one of numb horror – that is, horrified but used to it. “Director and screenwriter Brady Corbet creates a feeling of expanse by letting scenes breathe. Without overselling it, without preaching it, Corbet presents the 21st century’s problem as essentially a moral one.